Swedish Algaion is a dark beast with a rather unique face which laid dormant for a number of years. Unbeknownst to me (and I suspect many others), the band has been in existence since early 90s, and counted Peter Tagtgren and Mortiis in its ranks at some time. However, it looks like the original founders (Marten Bjorkman) kept the gloomy fire burning deep within and so Exthros is now born, 13 years after the previous full-length release. I could be generalizing, but it seems to me the album will be both an interesting experience, as well as a hit-and-miss for many. Sandwiched between two spacey instrumentals Alpha and Omega are a number of tracks I could not characterize other than melodic techno black metal. Some of the steadiest rhythmic structures you will ever hear, drummer Robert Eng (Corporation 187) slow blasts this creature along with a foundation so monotone, it seems to be almost machine-like. Later on in the album the rhythm is allowed to change, but for the first 3-4 tracks the techno-like steadiness comes off as very unusual, especially given the “black” tag the band carries, since in the minds of many “black” is often associated with chaotic. Algaion does not bring chaos in at any point, but amongst these super-mechanical riffs, the guitars constantly weave brooding and depressing melodies. The leads of Theos Tou Aimatos and The Last of Cursed Days are even more pronounced and all the more welcome because of how they stand out against the songs’ cadence and pulse. With the voice of Marten being these hysterical heart-rending vomitous howls riding at the top of the picture, and the bottom being as steady as it can be, the melodies unavoidably occupy the middle spot and manage to project the emotions of sadness and inevitable apocalypse. Something that upon the first few listens looked a little repetitive, slowly and surely managed to pull me in, right into the darkness, based solely on the catchy factor. A touch of keyboards on Nature Our Slave and This is Our Temple sounding very appropriate, Exthros at times comes of as a mixture of Hellveto rhythms and approaches to black metal with some distinct and expansive Gothenburg melodies (The Last of Cursed Days). As I mentioned, Algaion does vary things from time to time. Ruach Adversi is a grand death march with a melodic soul, which could be confused for a softer Kataklysm song. House of War and in part Nature Our Slave go for a more power metal double bass rolls and obvious expansive melodies, allowing guitar/bass interplay to come out and stand in front of the drums. It is probably a pure coincidence, but as I finally grasped and began enjoying Exthros’ essence, my mind drifted back to this year’s Rotting Christ Aealo. Nowhere near as militaristic, and rather atmospheric than anything else, Exthros, however, does cross the same plane. And wouldn’t you know the album cover shows ‘th’ syllable as a Greek and Algaion covers Rotting Christ and its precursor and parallel Thou Art Lord. 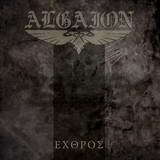 It could not have been that Exthros has been sprung into action by Algaion listening to Aealo, as the two albums are way too close in the time continuum, but there are eerie similarities and the inspiration for the bands could have come from neighboring wells.